Streamline business travel and expense system provide automated workflow from travel/hotel/taxi bookings in India or anywhere in the world with invoices management to reimbursement. Overall rating is 4.8 out of 5 for Travel Expense Management Software by 265+ Clients on 300+ Projects. Expense Management System [EnavExpense] is a solution to streamline and automate the submission and approval of multiple expenses and expense types. Expenses include travel, lodging, car rentals, meals and so on.Travel & Expense Management System [Enavtravel] focuses on restructuring company's travel expense to cut losses and maximise profits. EnavExpense is an enhanced resource for companies looking for asolution for managing travel expenses. EnavExpense is part of the total expense management offered by Enaviya. When it comes to our trade, Travel and Expense software system outclass its competitors through its clear cut uniqueness and efficacy. Travel and Expense Management is exhaustively equipped to put you in control of overheads bringing about a healthy bottom line, here's why? Comprehensive integrated features to organise the procedure, task based program for business travelers/trips to provide simplicity and not miss on in-depth process detail, designed to keep the right money at the right place at the right time. Travel & Expense Management can mould itself around your company and deal business exactly as you would. 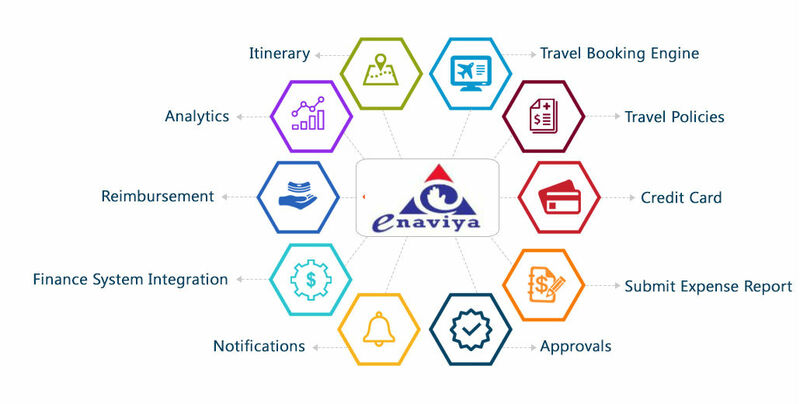 With Enaviya EnavExpense, your company's travel expense management is in safe hands, read on.